Welcome to Instagram! Now you can finally share all of your nonprofit's amazing photos with cool filters! You're now a part of the most active community on social media! Instagram is great to submit photos of your work and to engage with some of the 80-million Instagram users already sharing images on the platform. Instagram is perfect, and reasonably straight-forward, if you're submitting raw, point-and-shoot photos from your phone. But what if you're using the account for images you've touched up or for digital promo materials you made on your computer? 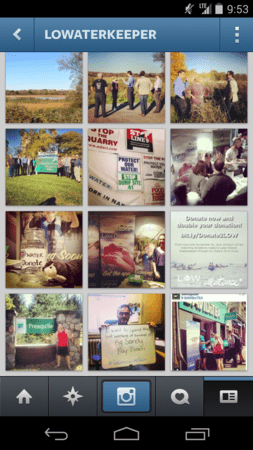 Lots of nonprofits are joining Instagram. Though I'm not advocating for slapping your newest digital ad on your Instagram account, it's nice to have a way to get a simple message to your followers. Saying thanks or telling your followers about a world-changing campaign can be done in a square-cropped Instagram upload way more effectively than simply in the caption text. After a lot of searching and fooling around with some (rather annoying) options, I found the perfect solution. At least the perfect solution for right now. Get a free Dropbox account. Download the Dropbox app on your mobile device (also free). Upload your digital assets from your computer to Dropbox. Open Dropbox on your mobile device. Download your digital asset to your device's camera roll. Open Instagram and upload from camera roll. Is it perfect? Absolutely not. Is it somewhat time consuming? Yeah, a little bit. Is this the best free option right now? You betcha! Instagram is a photo sharing community. Keep that in mind before you start posting a bunch of promo material on your account. Your followers aren't going to appreciate content they can't connect to on a human level. Design accordingly, folks. Do you have another Instagram hack? I'd love to hear it. Leave a comment or tweet me @AllieKosela.